Offline Storage Supports. Your drawing will be stored locally until you manually cleared the local storage or stored your drawings online. Online Image Search. If you want to borrow some ideas from internet, this feature allows you to load an image directly into iPaint if you know the image url. 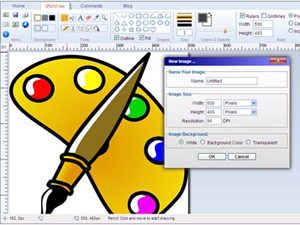 Or you can search online images and load that iPaint to continue with your great design. Image Sharing. Share your drawings with your friend easily via email. Rich set of Geometric Shape.. Free pen drawing, line, ellipse, rectangle, rounded rectangle, polyline, polygon, triangle, diomand, pentagon, hexagon, 4-point star, 5-point star, 6-point star, heart, balloon callout, bezier curve etc. Outline/Fill support. "Solid" or "None" options are available through floodfill algorithm. Photoshop a like color picker for accurate color selection.